The Fringe, originally an offshoot of the EIF, is now the largest arts festival in the world and has been the launching pad for many world famous acts, including the Monty Python team, Derek Jacobi, Flight of the Conchords and Steve Coogan. Edlets are official accommodation partners to Edfringe for the third year running and we’d be delighted to offer your property to our international guests to Edinburgh. Edlets are Edinburgh’s largest booking portal for short lets and our local staff provide a unique 5 star service by offering realistic and trusted advice by phone and email in a professional and timely manner. 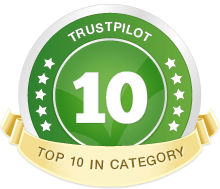 We have many satisfied customers, a dedicated bookings and customer service team with a current TrustPilot rating of 9.5 out of 10 – not something any of our competitors for Edinburgh-based accommodation can match. What other Edinburgh properties are available in August? How do I join the Festival Accommodation list? Please see Points to Note for First Timers further below for a few more details. If you have already worked with Edlets in the past, then simply give us a call on +44 131 510 0020 or e-mail us: accommodation@edlets.com and we’ll update your listing if required and start the matching guests to your property! What happens after the Edinburgh Festival? Edinburgh has events all year round – the Edinburgh Marathon, Hogmanay, Edinburgh International Film Festival and the International Science Festival to name a few. Not to mention all of the gigs and other reasons that guests require accommodation is over. Also, if you fancy a wee trip away at some point, why not raise some extra cash for it by letting your property out when vacant? After August, you are entirely free to remain on our records and let us know when it is that you wish to advertise your property for (whether be only for the following August and surprisingly, some guests do book again straight away! ), you can delist your property so that it isn’t available to view online any more or we can remove the records completely for your own peace of mind. Points to Note for First Timers. You have control over your enquiries – you can choose to respond to them individually or if you prefer, we can set prices on your behalf. You can specify minimum and maximum durations, numbers of guests and more. If you advertise elsewhere already then we can provide 2-way calendar synchronisation with most other booking websites including Airbnb, Booking.com, HomeAway, Tripadvisor and many more. We do not personally inspect properties ourselves. When a property listing is submitted, we require personal and property verification from hosts and we have both our own online review system for each property listing plus we request reviews from each and every guest via TrustPilot once they have booked their visit. ← Edinburgh – the Festival City!